The Tenchu series has been about a long time, dating right back to the original PlayStation. It's had hits, it's had misses, now it has a Wii entry. 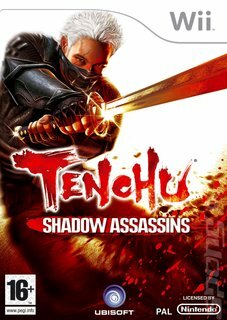 Shadow Assassins returns players to feudal Japan and once more puts them in charge of Rikimaru and Ayame of the Azuma Clan. It's their job to do the bidding of Lord Gohda which, as it happens, often involves a spot of assassination. You know how it is... Anyway, political intrigue abounds, but it's ultimately Lord Gohda's daughter, Princess Kitu, who pays the price. Gameplay revolves around stealth, so if you're looking for an action brawler, you'd best head elsewhere. Getting through a given level is about planning your route carefully to stay hidden, picking enemies off silently along the way. Well, we say silently, but there's a lot of different ways to kill your foes. Snap necks, choke, drown, burn, blow up, slice, dice, toss shuriken about and even poison your enemies to get the desired effect. Aiding in this is your 'mind's eye', a super-sensitive vision mode that will pick out enemy heat sources and make the most of line of sight. Shadow Assassins might not be all about the head-on fights, but when they come, they come big. Players will be sucked into a first-person mode and made to do battle with their swords!